Air circulation - Make sure there’s always plenty of air moving over all the buds and leaves, and through the plant. This can take careful planning. Don’t let plants get cold, if possible - Temperatures warmer than 68°F (20°C) help prevent fungus spores from germinating. 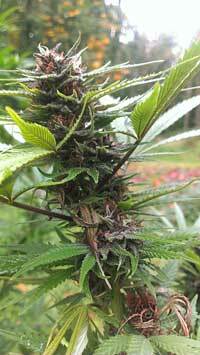 Avoid wetness - Don’t allow buds to sit in damp or overly humid conditions for long. Bud rot is a fungus, and like all fungi, it needs a wet place to germinate. 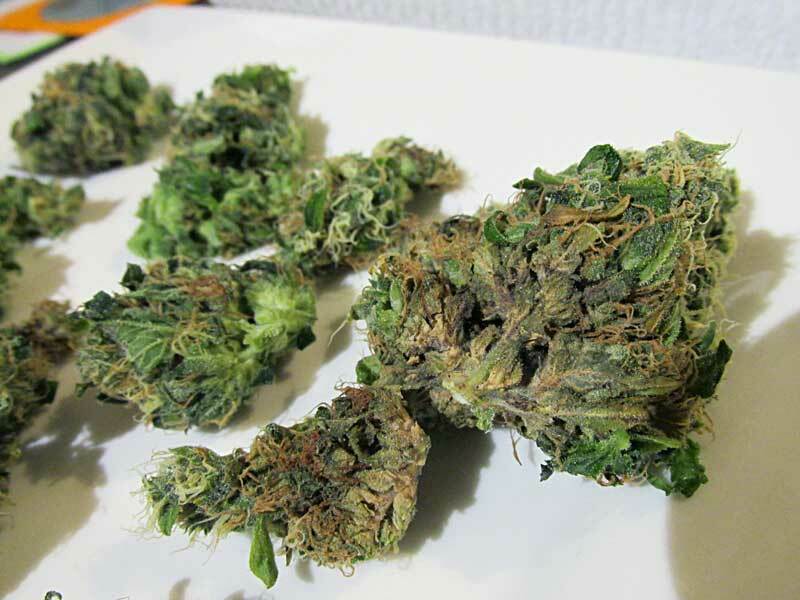 Remove all affected buds - Carefully remove and discard all buds with bud rot, as well as nearby buds - this is incredibly important if you don’t want to lose the whole harvest! Don't let anything any of the rot touch other parts of your plant. What Does Bud Rot Look Like? Usually a bud rot infection becomes visible in just certain parts. Sometimes just the bigger and more dense buds are affected, but other times you'll get patches all over the plant, especially after a few rainy days. You may see areas on the colas where everything (buds, pistils and/or leaves) are darkening, becoming discolored and/or drying up, unlike the rest of the plant. The deadened spots usually stand out and catch people's attention, even if growers don’t know what’s wrong, they often instinctively know that something is wrong since the spots don't look like the rest of the buds on the plant. 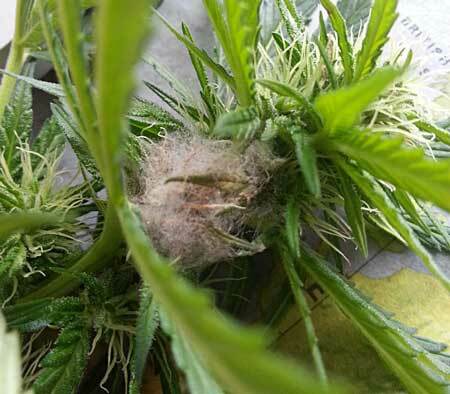 In addition to the rot itself, you may see white mold on the outside of the bud at first - this is the first stage and it means plants need to be treated immediately! With advanced bud rot, the bud will easily separate so you can see inside. When the bud in question is inspected, it will be dark on the inside, usually gray or brown, and possibly dusty (this "dust" is fungus spores). Different Stages of Bud Rot - Catch it Early! 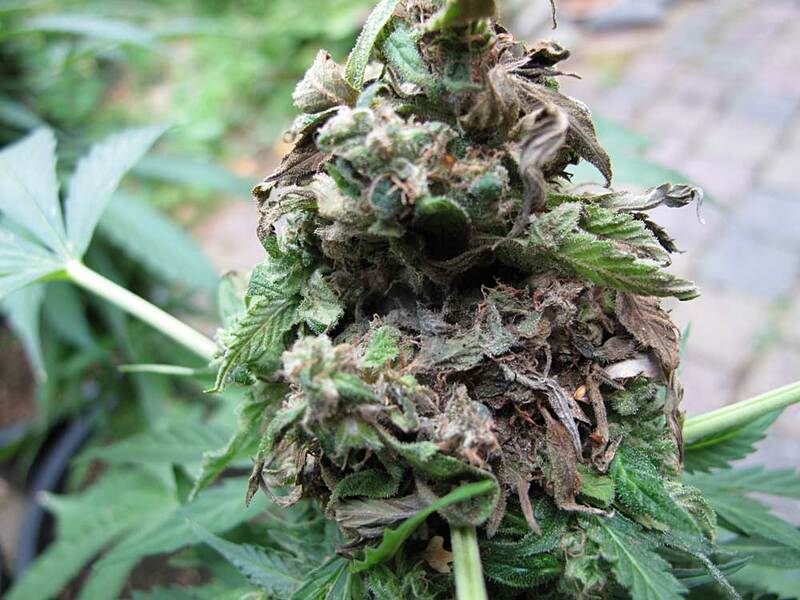 When plants are afflicted by cannabis bud rot, it starts as fluffy white growth in the middle or sides of buds, but the white mold quickly darkens into gray or brown and burrows deep into dense buds as the fungus takes hold. Sometimes you'll see the initial stage on the sides of buds, giving you a possible chance to catch the infection early. 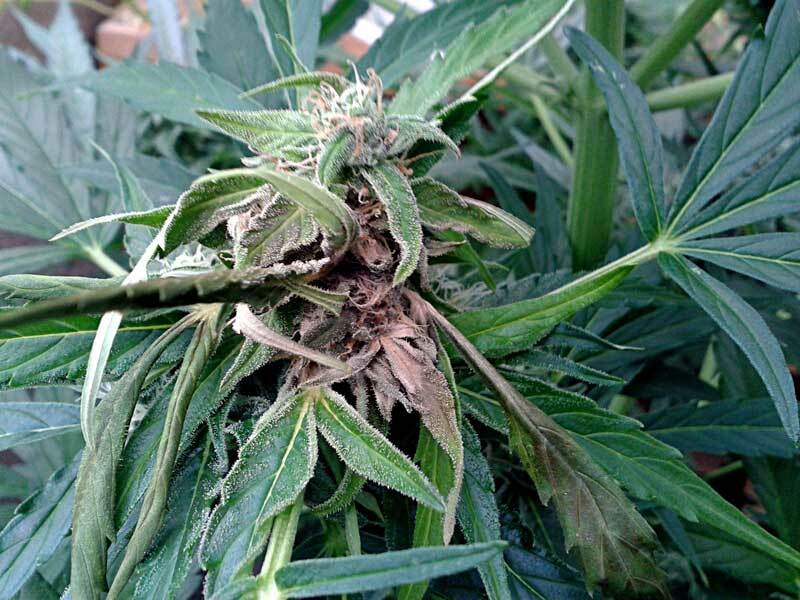 Once bud rot has taken hold over parts of a cannabis plant, the buds can sometimes look almost the same on the outside, at first, but they usually start looking like they're dying in patches. Often the area will dry out and easily pull apart. 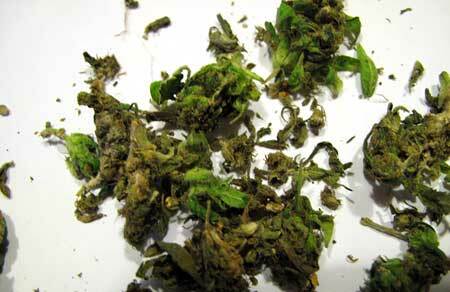 The inside of buds can turn brown, gray or even purple. "I noticed one brown sugar leaf and it came out unfortunately easily, exposing what was inside." Some growers might think these drying spots mean that the plant is almost ready for harvest, but you know something is definitely wrong when just parts of the colas are being affected. 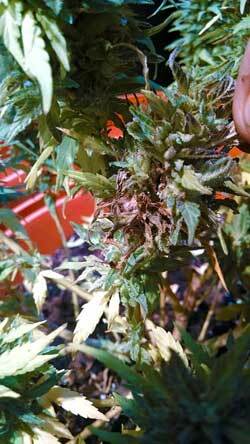 Cannabis bud rot is caused by a type of fungus known as Botrytis cinerea. 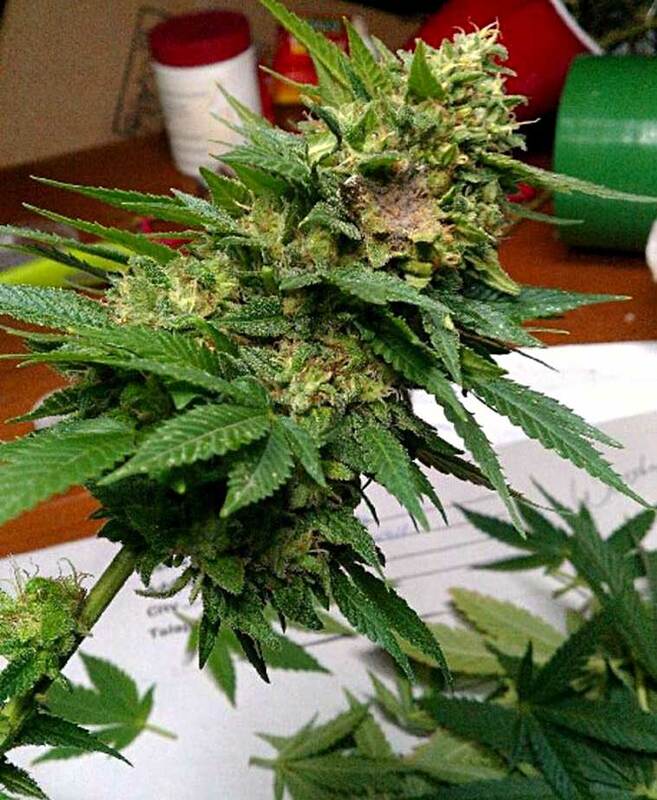 In cannabis plants, Botrytis causes buds to rot out from the inside, hence the name “bud rot.” If you crack open an infected bud, the inside will be a moldy dark gray or brown. Bud rot can show up in many ways. For example, this cola here responded to bud rot by turning purple and mushy. with leaves that becoming crispy and dying. This is what the grower came back to find after a few days of rain. Did you know? In addition to cannabis bud rot, Botrytis causes problems for many different types of plants, including wine grapes, strawberries and peonies. When it comes to cannabis, it is often only called “Bud Rot” since that’s the main symptom cannabis growers are worried about. Any part of the cannabis plant affected by bud rot should be discarded immediately! 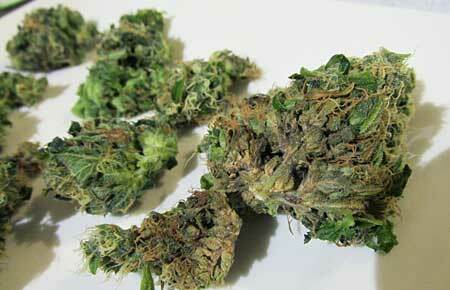 This helps prevent further infection and all buds touched by this toxic fungus should never be smoked or used. 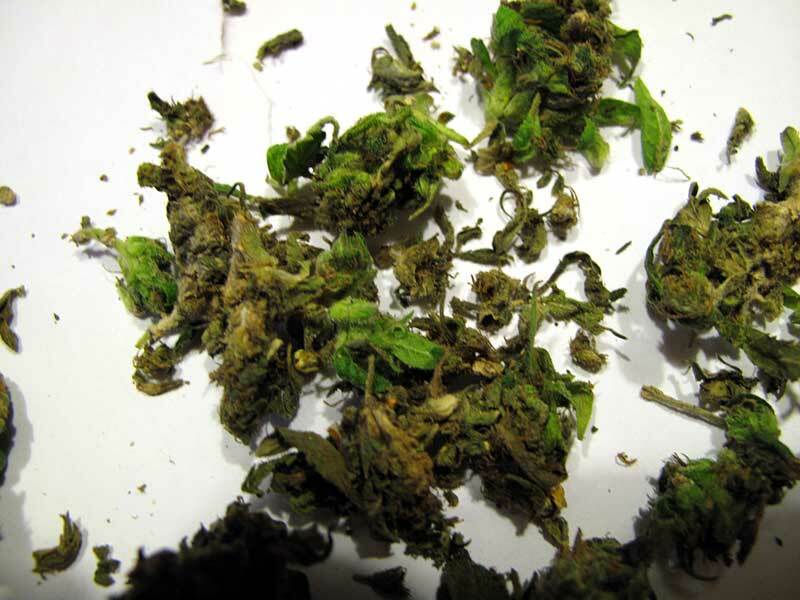 Throw Away All Buds with Any Sign of Bud Rot! There are different stages of Botrytis as it matures and tries to release spores. An infection starts as fluffy white mold, and then spreads throughout the inside of vulnerable buds. The inside of those parts of the colas darken to gray or brown. Once that has settled in, the mold tries to reproduce. The insides become filled with dark speckled dust that easily floats and spreads if the bud is cracked open. These are the spores of the fungus, so be careful to avoid breathing in letting this speckled dust ever touch other parts of your plants. Luckily, healthy cannabis plants will not develop bud rot unless exposed to stagnant air and cold, wet conditions for an extended period of time. How does the Botrytis fungus get to my plants? 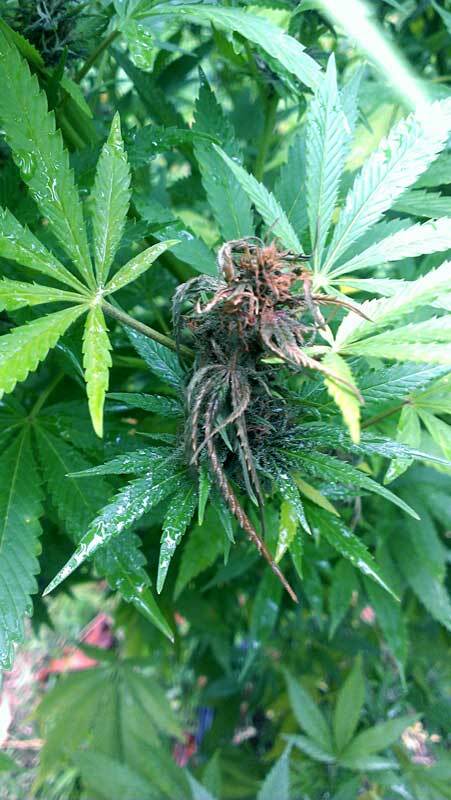 Bud rot is spread to plants by dusty gray spores, usually in wind or water. If your plants are never exposed to these spores, they will never get bud rot. Unfortunately the spores can easily be carried to your plant by a breeze, rain, from contact with animals, or even by clones from another grow room. Dormant spores can survive in many conditions only to affect your crops another time! But... it's not so bad. The fungus will never germinate if you take good care of your buds. And in any case, your plant needs a “wound” of some sort for the spores to take residence in your buds. Possible wounds that can let Bud Rot fungus in include cracks in the stem from wind or over-training, damage from caterpillars, snails, worms, white powdery mildew, other pests and larva, or any other type of injury or weak point can the the point of entry for bud rot spores into the plant. Luckily, even if your plant has been exposed to spores, Nothing will be able to survive and begin the cycle of a bud rot infection if you provide your cannabis with a warm, dry breezy environment. Bud Rot needs cool, wet conditions and stagnant air to thrive. What triggers spores to grow into a full-blown case of bud rot? Massive, dense colas have nice wet conditions on the inside which don’t get exposed to any air. This makes them a prime target for Botrytis bud rot. Good air movement - Create good air circulation and make sure there’s always plenty of air moving over all the buds and leaves. Keep plant warm, if possible - Temperatures below 68°F (20°C) creates the right environment for fungus spores to germinate. Controlling temperature goes a long way. Avoid letting buds stay wet - Don’t allow buds to sit in damp or overly humid conditions for long. Protect your plants from rain and control the humidity. Remove all affected buds immediately - Carefully remove and discard all buds that have possibly been affected by bud rot. Don't let any rot touch other parts of your plant. This helps prevent bud rot from spreading. Avoid plant wounds. 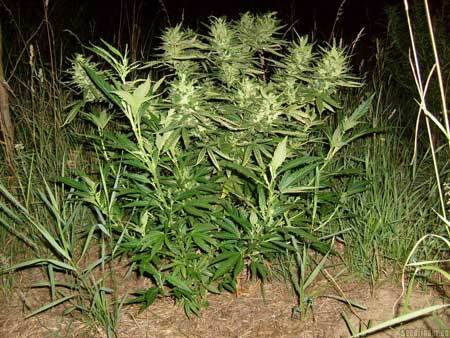 Avoid injuring your plants, especially in the flowering stage. Don’t leave open wounds to seep out water and nutrients - cover any open injuries with tape or some other “cast” until injury closes up. Also avoid pests and keep plants healthy. A healthy plant is much less susceptible to infections. Defoliate leafy plants. Remove leaves on very leafy plants, but don't take too much. In fact you want to take off as few leaves as you can, especially if growing outdoors. 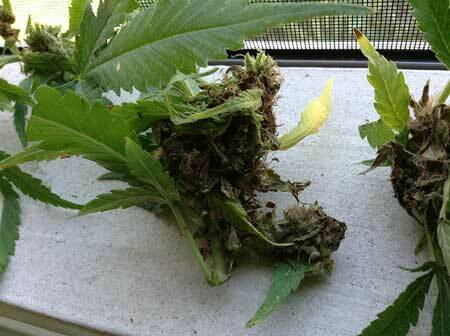 Only remove leaves that are covering or touching bud sites, as well as any leaves that are laying on top of each other. Your plant won't "mind" if you only remove leaves from leafy areas, and this prevents moisture from collecting into damp spots, while also improving air circulation around buds. Watch out. Watch plants closely for signs of bud rot in the late flowering stage, especially on large or dense buds, and especially after cool, wet weather..
Get a strain meant for your local weather. If you live in a place that has short summers and gets cold or rainy early in the fall, don't get a strain that was developed near the equator! There are fast-flowering, cold-resistant cannabis strains which are designed for growing outdoors in cooler or more rainy climates. For example many auto-flowering strains have quick lives - perfect for a short summer before the Autumn rain or frost. A good outdoor strain for those worrying about bud rot might be Auto Frisian Dew, an award-winning, mold-resistant strain made for outdoors. This strain goes from seed to harvest in about 12 weeks. Just plant seeds after the last frost in the Spring, then harvest 3 months later. AutoFrisian Dew is resistant to fungus like bud rot. This strain is quick to harvest and will grow in any climate which has (at least) 3 warm summer months before it starts getting cold or raining. Breezy location - Try to plan your grow spot so your plants get a breeze, but not too much wind. This can be tricky, and it may mean visiting the grow spot a few times before planting. Protect your buds from rain. If you know there will be drizzly conditions, cover your plants with a tarp to protect them from most of the rain. Don't put tarp directly on plants or you'll hurt you buds. Install the tarp up above the plants, and make sure it's held up by the center part, that makes it so rain runs off the sides of the tarp instead of collecting in the middle. Shake plants. Some growers shake their plants on dewey mornings or after rain, so any water drops that form on the leaves don't become breeding grounds for spores. 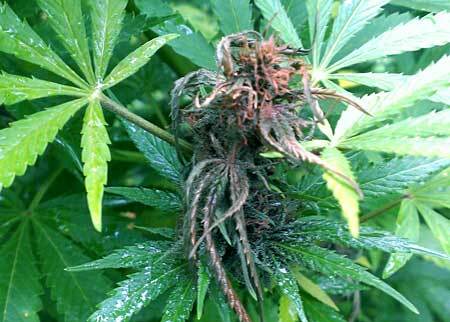 In the flowering stage, never use fungicides, spray affected buds with Neem oil, or burn sulfur. These common tactics are not effective at stopping bud rot, and will make your buds taste, smell and look terrible. Some growers use fungicides made specifically for Botrytis in the vegetative stage. But when it comes to cannabis, fungicides can only be used as a preventative before any buds have formed. If you already have bud rot and can't fix your environment (which is the best way to kill Botrytis), I highly recommend cutting your losses and taking down the plant. Most fungicides are not effective for bud rot. If you do plant to spray plants, it’s recommended to get one that’s specifically been developed to combat Botrytis. Any treatments for Bud Rot should be applied in the vegetative stage as a preventative. The inside of dense buds provide a great place for Bud Rot spores to grow, and that’s the main place you’ll find developed Bud Rot on cannabis plants. 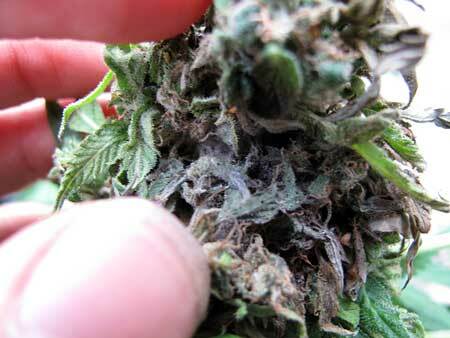 Once you've spotted bud rot, it's important to act immediately. 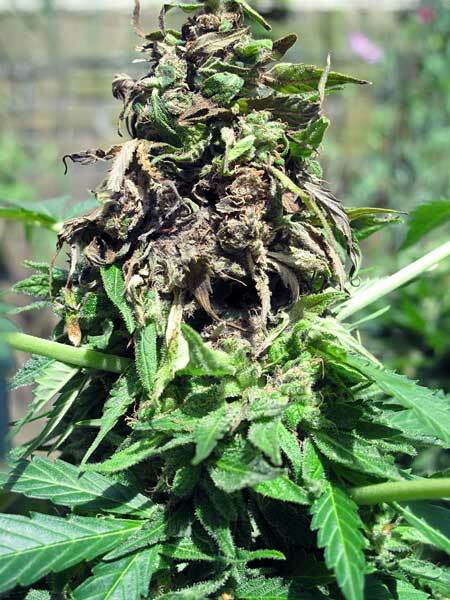 As soon as even one part of a single bud starts showing signs of grey mold, the rot can spread to the rest of the cola and then to other buds on the plant. If triggering conditions (lack of airflow, heat, wetness) have not improved, a single point of infection can quickly ruin the harvest of an entire plant. Never Spray Your Buds with Anything! Immediately remove all rotted parts and nearby areas. The only way to stop the spread is to remove all signs of mold from the plant, then move plants to a warm, dry area with a nice breeze. Be extremely careful not to let any rot touch any part of the rest of your plant. If your plant have been affected by bud rot, it means they need less dampness, drier air and warmer temperatures. If you can improve the environment, you can allow the plant to continue ripening after you've removed the infected buds. If you can't fix the environment, I highly recommend cutting your losses at this point. If you know that it's still going to be cool, humid or wet for your plants, it's recommended you harvest immediately to prevent further buds from becoming infected. Buds harvested early are better than moldy buds! 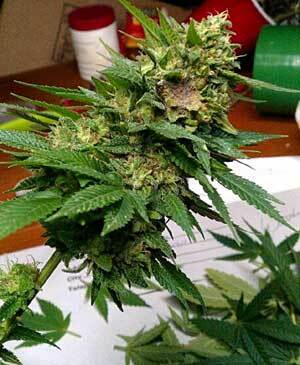 Whenever you do harvest your healthy buds, be extremely careful during the drying process. Normally growers want to slow dry buds, but if you're worried about mold it's better to dry them faster, with plenty of air circulation and movement.